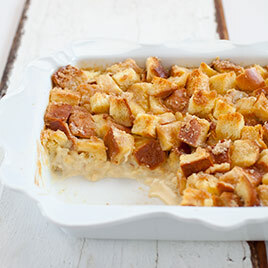 Home-style bread pudding made with day old french bread. Break the bread into bite-sized chunks. Drizzle butter on top of bread. Grab a casserole dish and place bread inside. Mix the eggs, milk, cinnamon, sugar, vanilla, bean/seeds, and raisins. Pour over the bread, stir a bit. Bake for 30-35 minutes uncovered. ← Hot Dog Egg Rolls!